By Dan Ambrose: Former heavyweight world champion Evander “The Real Deal” Holyfield says the judges made the wrong decision by not giving Gennady “GGG” Golovkin the win over Saul “Canelo” Alvarez in their recent fight on September 16 at the T-Mobile Arena in Las Vegas, Nevada. Holyfield saw Golovkin being the one that made the fight, and Canelo was running like a “chicken” and not wanting to fight. Holyfield doesn’t see how the judges could even score it a draw, as he felt the fight was a clear win for Triple G. The three judges scored the fight 118-110 for Canelo, 115-113 for GGG and 114-114. Holyfield says he likes Canelo as a fighter, but he was just running from Golovkin for the entire 12 rounds. Holyfield was a warrior during his boxing career, and he would never even for a second consider fighting the way Canelo did against Golovkin. It’s not the way you fight when you’re trying to beat the champion of the middleweight division. Canelo was the Ring Magazine champion, but not the true champion. He was the guy that won the Ring title in beating Miguel Cotto at a catch-weight of 155 lbs. back in 2015. “I think the judges got it wrong,” said Evander Holyfield to Fighthub in talking about the Canelo vs. Golovkin fight. “I think Triple G made the fight. It probably wouldn’t have been a fight if he hadn’t made the fight. He was the one that was chasing the guy. He was the one that wanted to win, and was aggressive. He landed the most punches. I just think overall, he fought a great fight,” said Holyfield. Holyfield brings up a lot of good points. Golovkin was the one that was coming forward, making the fight for the entire 12 round contest. Golovkin fought like the challenger, taking the fight to a reluctant champion, who was just spoiling and trying to survive to the finish. Canelo fought a lot like Martin Murray fought against Golovkin by running from him and just trying to land single pot shots. Holyfield doesn’t see what Canelo was doing as someone that is trying to win the fight. Canelo had said before the fight that he was going to KO Golovkin. It was his dream to knock him out. But the moment was clearly too much for Canelo when he got inside the ring with the unbeaten 35-year-old Kazakhstan fighter. Once Canelo started taking shots, he gave up on the idea of trying to knockout Golovkin, and instead he focused on survival. Golovkin chased Canelo the entire fight, hitting him with jabs and hooks. Canelo only fought when he was trying to get Golovkin to give him some breathing room in the first 45 seconds of each round. After that, Canelo was done for the round. He’d run for the last 2 minutes until the round ended. It was pretty disappointing to watch, because it was a worse performance from the redheaded Mexican star than the one he’d turned in against Floyd Mayweather Jr. Canelo quit in that fight and stopped trying to win after the first 2 rounds. Against Golovkin, Canelo was done after round 3. He didn’t do anything after the third round other the fight briefly at the start of rounds 4 through 12. “I think it would be the same,” said Holyfield when asked how the Canelo-Golovkin rematch will play out. “It would be pretty much the same. It all depends on if Alvarez fights. The fact of the matter is you got one guy making the fight. You got the other guy feeling like he’s just going to play it safe. It’s because it’s a difficult fight. If you’re overly aggressive, you run into shots. You can get hurt. Triple fought a great fight. It’s impossible for a judge to even call it a draw. Both guys are super fighters. I like Canelo. I think he brings a lot. That’s the reason he has a lot of fans. Triple G, he brings a lot to the fight too, and people choose who they like. He’s a work man. He works hard all the time. He makes adjustments that he needs to make. He’s a great fighter, Triple G. He’s a smart fighter on defense and offense. He’s going to fight a good fight. You know what you’re getting when you get Triple G.” said Holyfield. •	Canelo won’t be able to attack Golovkin because he’s not tall enough and his reach is too short. If you look at the replay of the Canelo-GGG fight. When Canelo did come forward trying to attack, Golovkin would stick a hard jab in his face, and stop his forward momentum. Canelo would then go back to the ropes and forget about attacking. I saw that same routine in every round. 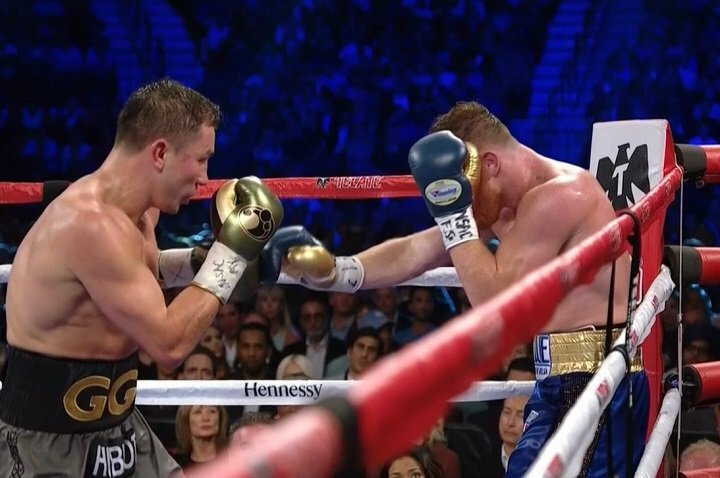 Canelo literally couldn’t attack Golovkin, because he didn’t have the arm, height or the jab to get close. When Canelo would attack, Golovkin would cleverly back up to avoid the Mexican star’s wild swings, which were usually uppercuts and hooks. The uppercut is Canelo’s bread and butter punch, but it’s only effective when his opponents are in close. Golovkin was rarely in close during the fight, so Canelo only landed a small handful of uppercuts in the fight. I couldn’t 4 hard uppercuts Canelo landed in the entire. It wasn’t nearly enough for Canelo to win rounds. The scoring abysmal from the judges that worked the fight. “Triple G is the champion, he’s the aggressor, and he’s putting pressure on the other guy,” said Holyfield to Es News Reporting. “The other guy when he fights, he’s moving and he can’t catch him, and they still gave it to him,” said Holyfield about the judges giving Canelo a draw despite all of his movement. “They need to get the proper judges that know how to score fights. I know who comes to fight all the time. Triple G, he puts pressure on people. He throws a lot of punches, he’s busy. I remember if you were in Mexico and you can from the Mexicans, they call you a chicken if you run. Now Triple G puts pressure on people. They move and nobody calls them a chicken. One guy runs from a guy, and if he don’t catch you, you’re a chicken. You’re running. The fight was only good because Triple G made the fight, because Triple G was the aggressor, throwing a lot of punches. He made the fight that it was,” said Holyfield. A lot of boxing fans would agree with Holyfield in saying that Canelo ran from Golovkin. It was a game of cat and mouse for 12 rounds. Canelo was the mouse and Golovkin the cat. The fact that the judges scored the fight as draw was just a testament to how poor the judging was for the fight. Golovkin and Canelo will fight again soon. The judging has got to improve for the second fight because it’s going to give boxing a black eye if we get similar scores in the rematch. Canelo so exhausted. There was no way I could give him more than 3 rounds. Canelo fought well enough to win 2 of the first 3 rounds. After that, I had Golovkin winning rounds 4, 5, 6, 7, 8, 9, 11 and 12. I gave Canelo the 10th, but even that round was close. Canelo got tired after the first minute and ran for the last 2 minutes, like he did in most of the other rounds. Canelo was showboating at times, and it looked unprofessional, because he was losing the fight. Showboating only works when you’re winning, not losing.